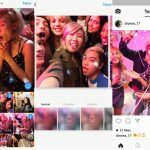 Instagram users have been using clumpy collage apps for sharing multiple photos or videos. This feature is finally modified by Instagram and now users would be able to upload as many as 10 photos or videos in a single post in the form of a swipeable gallery. The multiple posts are denoted by a small icon and a series of blue dots below the first image. The photos can be either filtered out and edited individually or all at once. The entire set would have a single caption. From the last six years when Instagram launched for the first time, it has been constantly working to improve its features. All kinds of previous constraints on photos including square, small and low resolution have been improved to make photos look better and share effortlessly. The feature is a part of update 10.9 and is available for iOS and Android. Here is a sample gallery for you.